Texture on inside wall of a crater in the Catena Mendeleev, a linear crater chain located inside Mendeleev crater. LROC NAC M113038958R, incidence 46°, image is 0.5 meters/pixel. 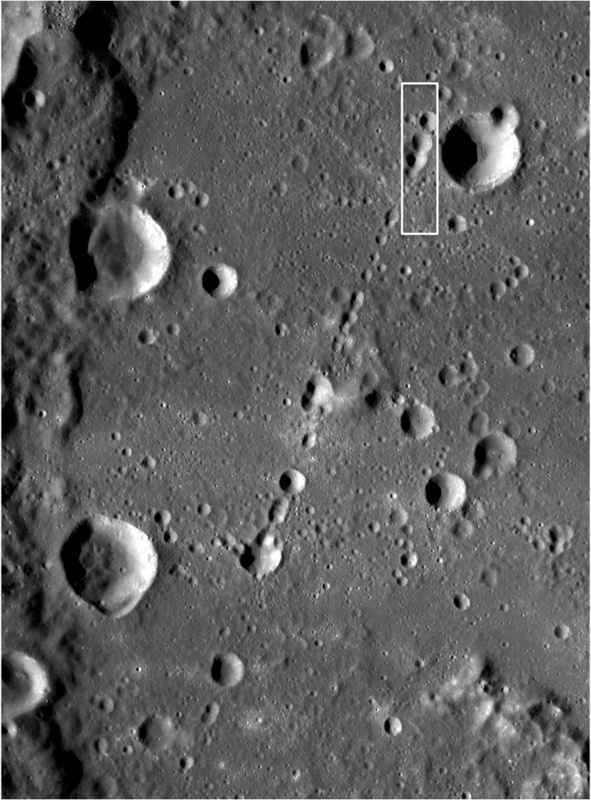 Catena Mendeleev is a linear crater chain probably formed by the impact of fragments (called 'secondaries' by planetary scientists) that were ejected by the impact that formed Tsiolkovskiy Crater, which is 850 kilometers to the southwest of Mendeleev. Crater chains form from secondary impacts ejected radially from their parent crater. Today's featured image shows the rough and smooth textures on the inside of one of these secondary impacts. Secondary craters in a chain are often elongate in shape, with irregular rims. Secondary crater chains tend to occur in a zone immediately surrounding a large primary crater. However, larger impacts can move significant amounts of ejecta, including crater chains, far from the primary crater, as we see here at Catena Mendeleev.